Some more visiting travellers, this time in a TDi300 Defender. 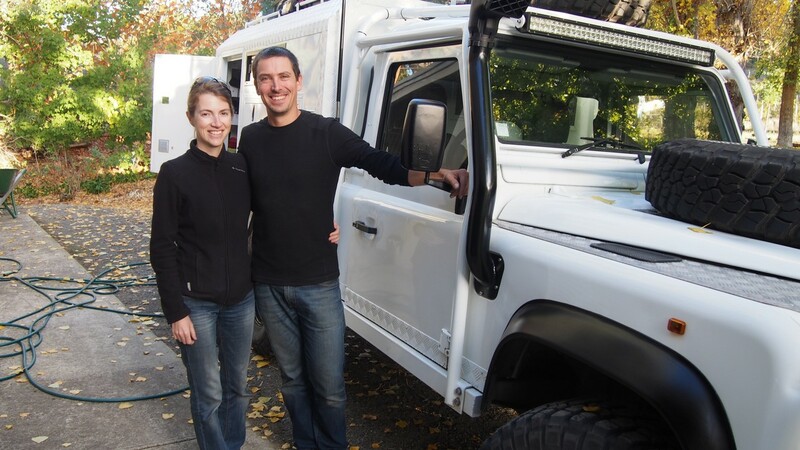 These guys bought this Defender in Brisbane a number of years ago and drove it back to France. After a couple of years back in France re-fitting out the Defender, they have shipped it back to Australia to explore for a year. They had some excellent stories about their drive back to France from Australia, especially going through Pakistan and Iran. It's been very nicely built (by Michael) and extremely functional. He even built the roll cage, and re-sprayed the whole vehicle. We had to do a bit of fabrication work to his back door as the locking mechanism had rattled apart on the corrugations on the way to Adelaide. An hour later we'd made a new heavier-duty backing plate for the lock and re-built the innards to get a working item again. There's a full size bed in the back that folds up into a seat during the day. And a lift up "tented hatch" on the roof to make things more spacious inside. We offered them a nice warm bed inside but they declined and slept out in their vehicle, so it must be super comfortable! They have left Adelaide and are headed up through the centre of Australia, through the Simpson Desert and the Anne Beadle Highway. They are welcome back here any time, especially as they can cook like champions!